Does anyone remember Chandu Halwai? They make the best Kaju Katli hands down! Sorry Ghastiram or Haldiram – you don’t come close.. In my humble opinion at least. After like 3 attempts to recreate that magic, everyone in my house literally begged me to give up and get store-bought Kaju Katlis. But I really didn’t want to. We all have that special sweet that we make or bring home to memorialize big or small things. For us, it was Kaju Barfi (Kaju Katli). My dad would buy this for my brother and I every time we did really well in school or when it was Diwali, Rakshabandhan and our birthdays. Years later, we moved out to pursue our education and career, but one thing never changed – whenever we came back to visit my parents, the fridge would have a box of Kaju Barfi waiting for us. So this is for you dad who taught me never to give up and my brother who loves this sweet as much as I do. I owed it to them to try and try till I got it right and finally I did. This recipe has been adapted from Show me the Curry food blog. I tweaked the recipe just a tiny bit and voila – there it was the perfect, soft Kaju Katli as we know it. Grind the cashews into a fine powder in ½ cup increments. Mix the milk powder and confectioners sugar well and microwave them on HIGH power for 1 minute in 30-second increments i.e. microwave them for 30 seconds and whisk them well and microwave them again for another 30 seconds. Cut the dough into desired shapes using a pizza cutter. They will be very soft to begin with and will start hardening in 10-15 minutes. Store them in a refrigerator. I think in step 2, you meant milk powder and confectioner’s sugar. Anything else I can use instead of milk powder?? That’s right, Nidhi. Good catch. I fixed it. Thank you! I haven’t tried this but I think you could skip the milk powder but adjust the amount of confectioner’s sugar. 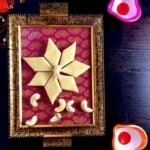 Most traditional recipes for Kaju Barfi use only Cashew powder and Sugar syrup.